I’ve always thought of jazz as an art form that allowed skilled, disciplined musicians a great measure of freedom. But jazz — like just about everything else — has been transformed by time and social change. Music once mastered in clubs and learned from other musicians now can be studied in conservatory-like situations where highly motivated young people pursue jazz with the zeal and determination you’d expect to find among a group of Harvard MBA candidates. 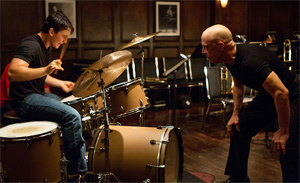 That’s the environment we find ourselves in Whiplash, an exciting and sometimes disturbing debut feature from Damien Chazelle, a director who obtains fine performances from Miles Teller as Andrew, an aspiring jazz drummer, and from J.K. Simmons as Fletcher, an unapologetically judgmental and sometimes sadistic teacher. Simmons, who portrays Fletcher as if he were a Marine Corps drill instructor, hasn’t had this kind of a badass role since he portrayed white supremacist Vern Schillinger on HBO’s Oz. If ever a teacher could create performance anxiety in his charges, it’s Fletcher. He leads the school’s prestigious first-string jazz band, and takes pride in its ability to win just about every competition it enters. Teller’s Andrew desperately wants to find a place in Fletcher’s world. He’s the kind of driven kid who’ll practice until his hands bleed. He sweats and drums himself to the point of exhaustion. When Andrew plays, it feels as if we’re watching an action movie. Fletcher specializes in pushing his students’ buttons, learning about their personal lives and using information he acquires to test their ability to withstand public humiliation. He’s quick to make fun of Andrew’s English teacher father (Paul Reiser), calling him a failed writer, for example. Simmons sarcastic tirades include a repertoire of homophobic slurs, delivered by him without an apparent second thought. All of this makes Fletcher frightening. He can be sympathetic when he chooses to be, but he’ll turn brutal in a minute, presumably to spur his charges to higher levels of performance. In a way, Fletcher is a second and much tougher father than Andrew’s biological father, who raised the boy alone and seems to display (heaven help him) a degree of sensitivity. Andrew’s mom left when he was quite young. Teller shows us some of Andrew’s vulnerability, but he also can be cocky. Andrew grows in confidence as the movie progresses, even dumping his girlfriend (Melissa Benoist) because he knows she’ll want more from him than he’s willing to give. Nothing takes precedence over drumming. Of course, there would be no movie if Chazelle didn’t build toward a major clash, and when it arrives, it hits the screen with near-explosive force. I don’t know exactly what Chazelle intended, but it’s striking to see jazz as a kind of competitive, striver’s pursuit for young men, most of them white. Whatever the movie’s messages (intended and unintended), the duel between Simmons and Teller proves mesmerizing, as is the music of Justin Hurwitz, who wrote original numbers for the movie, which also makes use of such jazz classics as Duke Ellington’s Caravan. The idea that artistic excellence can’t be achieved without this kind of torment may be baloney. The movie’s notion that greatness can be tortured out of students isn’t likely to win many converts. But I wouldn’t miss the battle waged by Andrew and his mentor. It’s not just about musicians pushing themselves; it’s about actors pushing themselves and about the desire to stand-out from the anonymous crowd. When it’s done, you may find yourself arguing with Whiplash, but you won’t be able to ignore a movie that feels every bit as driven as its characters.